Vitalik has been on 🔥 on Reddit this past week. First by going on the BTC community and expressing frustration about all the bad-mouthing of ETH, with this comment on a thread about Greg Maxwell saying ETH value is $0. The difference in culture and community between the Bitcoin and Ethereum communities is fascinating to watch. The types of people that are attracted to both, their reasons, the reaction to having a central leading figure; these are all things that influence the development of projects and where people and developers will gravitate towards. Scams are running rampant on both Slack communities and ICOs. One of the biggest growing pains of the crypto space is certainly professional scammers. We had those in the early internet days, and we have them now in the early crypto days. This is the method used to scam people who want to participate in an ICO by creating a similar website / twitter account / slack community / whatever, and tricking people into contributing ETH/BTC into other accounts than the official one. Always triple check when participating in an ICO that you are on the official site and are sending to the official smart contract (etherscan has started verifying contracts and you usually can see it there). This is an even sneakier model. 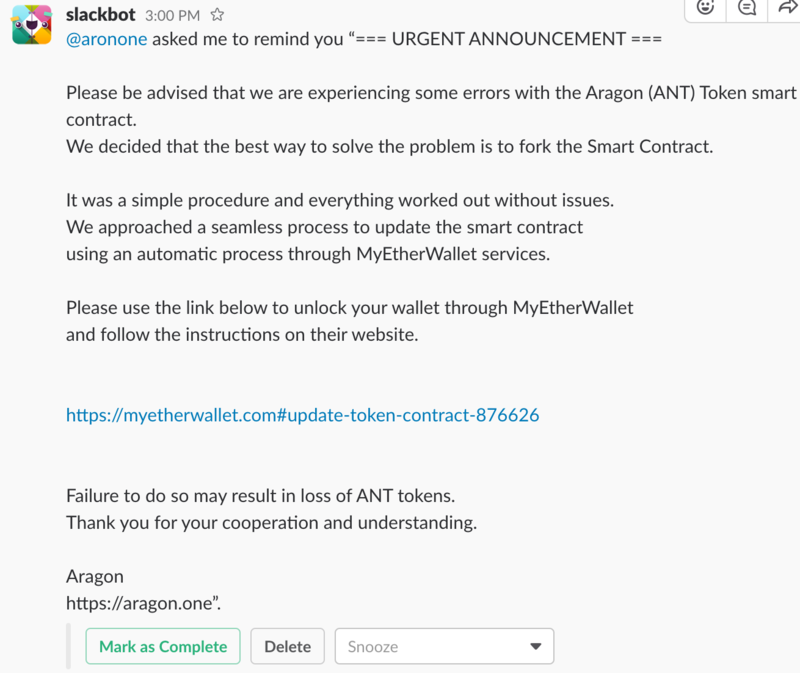 Scammers here use profiles and bots on Slack communities to link to phishing sites that resemble MyEtherWallet. These scams are working and there's plenty of comments from people who lost funds. BE CAREFUL. I've asked on Twitter what's the easies way to be safe on MEW, and here's what they had to say. Example of phishy message below. Be careful out there and don't click on anything! My suggestion is using a Trezor and running Mew locally. You can download it from Github. This Chrome extension that disallows interacting with blacklisted phishing domains also comes highly recommended by the folks at Mew. I think that people underestimate the amount of progress in decentralized computing projects outside of ICOs. The space is literally booming with new ideas and the projects that have been here for a while are also continuing with amazing progress. Pieces of the stack like BigchainDB are critical to mass adoption. For those who don't know it, BigchainDB is a blockchain-based open source database that tries to marry all the usual database features with the advantages of the blockchain technology. You can roll out public or private chains. It really is a big deal in my opinion. Truffle is the most popular development framework for Ethereum and just released Truffle Boxes, which are helpful boilerplates that make it easier to bootstrap a dapp. In addition to Truffle, Truffle Boxes can contain other modules, Solidity contracts & libraries, front-end views and more. A deep analysis of Tezos' security, proof of stake algo, and self-updating protocol. The author looks at the factors contributing to ETH's price, and argues that one of the main ones is the amount of ETH that is locked up in different places, be them ICOs or applications. A nice interview with Luis from Aragon, predicting $1k ETH in 2 years. A nice overview of what Melonport is trying to build. Melon can be thought of as a system of tools that enables participants to set up, manage and invest in digital assets and have management strategies that exist within a customisable, predefined ruleset. The system itself is decentralised, and minimises the requirement for trust. Neufund used its technology to tokenize their own stock options. Smart Contract Solutions rebrands to Zeppelin Solutions today. The company will continue the development of OpenZeppelin, provide auditing and security services, as well as escrow for private keys. I've had the chance to meet Demian in SF as we were working on similar things, and it's been amazing so see the growth both in terms of technology and community leadership. Aragon's first quarterly update to bring the community up to speed on where they're at and the road ahead. They have planned out releases 0.4 to 0.9, with the first one coming out around December and enabling main-net Aragon organizations. A recap of TenX's team and ambitions after the recent very successful token sale. Still extremely hard to figure out who's in it for the long run, and who's just riding their token price. Will need to get better at this. A short salesy alert by Wilson Sonsini Goodrich & Rosati, but interesting and a must-read if you intend to issue tokens as a US company. Details on the Decentraland token sale which will begin on August the 8th. You will need 1000 MANA tokens to claim a parcel of LAND. The ICO will feature a reverse Dutch auction, 3-year vesting, 8% first-year inflation with continuous token model. Really interesting to see the continued experimentation in token sales implementations. Worth reading their initial post on MANA and LAND. Wanted to get yourself some XRL? Not gonna happen. They have reached their maximum cap of $10,000,000, 10 days before the crowdsale even started. DNT is going on sale on July 18th. The Santiment token sale is officially over and reached the hard cap of 45,000 ETH. 710 people participated in total. This was Cofound.it first project to complete an ICO. MyBit - the platform for tokenizing revenue streams." It seems that at first they want to invest in decentralized renewable energy sources and in the future in things like self-driving cars, so that everyone can share in on these profits. Coindash - "An operating system for crypto assets" with saas tools, social trading and more. Bisq - A colored coin on the Bitcoin blockchain to enable decentralized fiat/BTC trades. It was only a matter of time before we had a decentralized marketplace for prostitution. And the time is now. Analyse any contract for critical security vulnerabilities and insecure coding. One click only. Formal security guarantees. Accepts source and bytecode. Extensible. A similar effort to Aragon to enable company creation on the blockchain. A new fund aims to give wealthier Latin American investors additional exposure to the burgeoning cryptocurrency asset class. The University of Sydney comes this new type of blockchain which can process 7x the amount of transactions on VISA/MasterCard combined. Litecoin ($LTC) continues to be very popular amongst Asian buyers, who are taking up to 60% of its volumes (over $1b/day earlier this week). Charlie Lee seems very focused in the short term on ensuring that LTC is traded on more exchanges. It is back up north of $50, and the best performer of the 'bluechips' as of lately. Blockchain Capital ($BCAP), the first venture capital fund to have done an ICO as part of their latest raise, released its first NAV this week and it is still close to paid-in capital ($1.03/BCAP token). Not that surprising given they have presumably only been investing for just over a month, in which the overall market has been mostly stalling. What's more surprising though is that the BCAP token was trading near $4.5/token when it first hit the exchanges in mid-May, representing a 4.5x multiple over par (currently @ $1.5) just after the money was raised. It will be interesting to see how these asset-backed tokens trade over time vs NAV. Taas for example is working on a fully transparent cryptographic audit dashboard that gives real time visibility of holdings and transactions. A decent CryptoCurrency Portfolio Template for Google Sheets. The simple fact that one still has to come up with such a tool highlights that no product out there is yet winning at portfolio tracking. If you are building something in this space get in touch! Token Economy is curated by Stefano Bernardi and Yannick Roux (who just welcomed his second-born to the world! 👶 🎉).